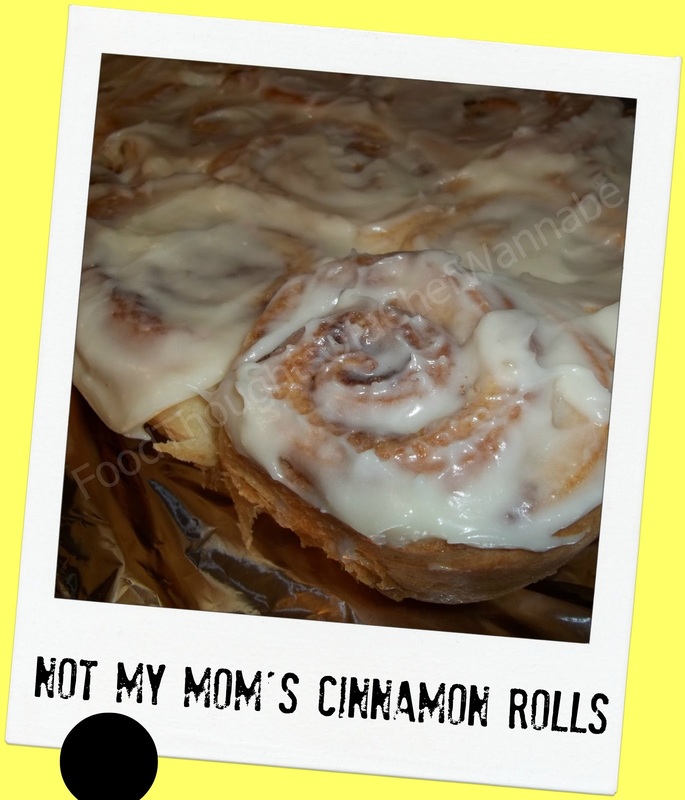 FoodThoughtsOfaChefWannabe: Not your mom's CINNAMON ROLLS! Not your mom's CINNAMON ROLLS! That's right, that is what I said. These are NOT my mom's cinnamon rolls! Her rolls were always a treat on holidays or for big events. I learned one thing from my mom and that is, everything doesn't have to be SO MUCH WORK to be amazing. It seems like it took my mom 2 days to make cinnamon rolls, and I grew up thinking they were this intense labor of love when in reality, these are ready beginning to end in maybe 3 hours. Ok, maybe 4 with rise time. Regardless, they are so easy. These cinnamon rolls are so light, so moist and just amazing. And for the record kids, it is a new day, and these rolls o' mine are incredible, better than hers! Make them, you can be the judge! Now, as far as cinnamon rolls go, I like them plain. I mean, no extemporaneous crap, raisins, nuts, etc. I want them dead fly free *raisins*, I want everything in my life raisin free in fact. So those things are all optional and I won't write them into the recipe because we discussed it here. Also, it is possible that I used more brown sugar than what is called for, for the filling. Sue me. You know you will too. OH, one more thing about these lovelies. They freeze SO well. After the dough rises and you get the rolls cut and put in the pan, this is where you seal them up tightly with foil and put in the freezer. When you want to bake them, you take them out of the freezer the night before, and set them on your stove top to thaw and raise, they will be ready for morning baking! Just an FYI. Combine all ingredients and set aside! Get your oven preheated to 350 degrees. Now, why didn't I take a photo of this part? Grr. Starting at the bottom start rolling the dough, go from the bottom and work your way across so it is eventually all rolled up. When you get to the end, pinch the seam together. Now you could get up to about 14-16 out of this, but I get 12. I like tall, substantial rolls. So using a serrated knife, gently cut it in half and then go from there. However many you want out of the roll, make it happen! If you cut them thinner and get 14-16, make usre to take 5 minutes or so off of your bake time! When they are cut, put them into a generously buttered 9x13 pan. I fit 12 perfectly. Get them situated and then cover them with a clean dish towel and let raise again, for approx 1 hr. If you have your oven on, and use my trick, it won't take that long. Bake for 30 minutes. Remove them from the oven and let cool for 15 minutes. I turn mine out unto a large cookie sheet because I find them easier to cut and serve that way. You have to flip flop a couple of times to get them right side up on the cookie sheet but I trust your problem solving skills will take you far in this one! I then frost them with half of the frosting. 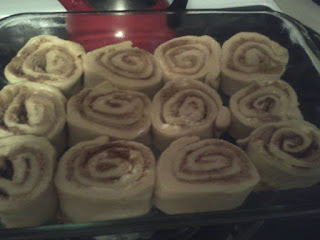 I wait until they are nearly completely cooled to put the rest of the frosting on. Some of it melts into the roll and you still have plenty on top! If you you are making these for a holiday, I find it pleasant to sprinkle them with sprinkles in the appropriate colors for your holiday. I didn't do it here so that you could just see the roll. Whoa.........was THAT fun or what?!?! Now get some coffee on, and let's sit down and discuss how awesome these are. If you wait to long you might have to give it 20 seconds in the microwave to warm it up because that is always how they taste best in my opinion! Awesome! So glad you liked them. Now I am hungry for one! Thanks for reading! 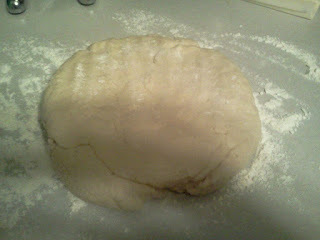 I aM in the process of the dough rising for thefirst tsime,right now.....they are going to rise for the second time in the fridge,overnight. I've done that before with this recipe and it does work....just set them out in the morning for about 45 minutes before popping them in the oven!.....Christmas morning cinnamon rollsand old fashioned hot chocolate with marshmellows, chocolate spoons! YUM! My g-kids look forward to it every Christmas! Love this recipe! Merry Christmas, Chris and Mr. ChefWannabe!